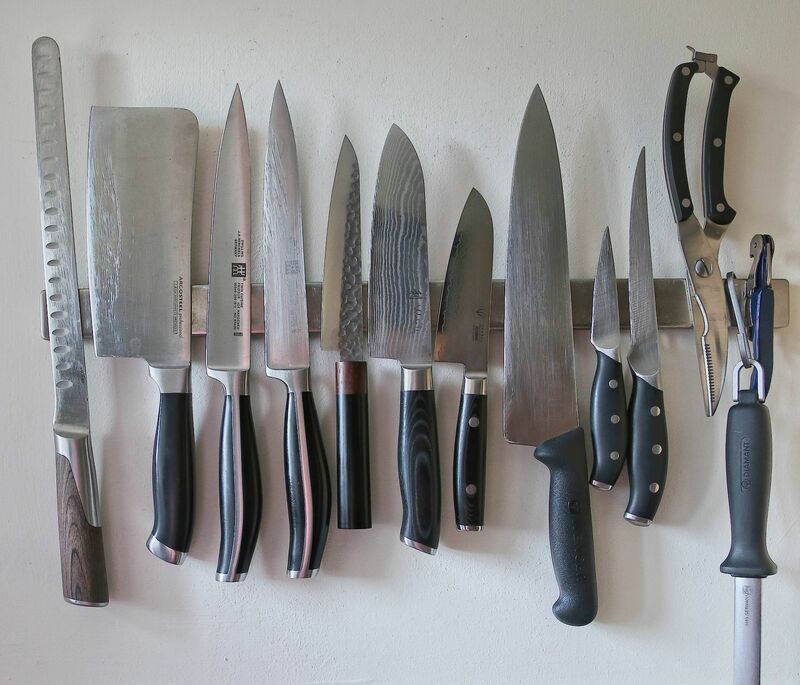 There is no such thing as an ultimate kitchen knife. Any kitchen knife is as good as it serves its purpose. Stamped vs Forged: Forged knives are considered superior to stamped. Not to to the degree that justifies huge price difference. Stamping is a less expensive technology than forging and uses less steel. As a result stamped knives are less expensive but that does not make them any inferior. Metal microstructure of cold rolled steel used for stamping and blanks used for forging is very similar. One of my favorite all around knives is Victorinox Swiss Classic 8″ Chef’s Knife , amazing knife price/performance-wise at about $30. Stamped knives are thinner which makes them easier to sharpen and maintain. The more layers the better, a common misconception of Damascus steel knives. The truth is that three layers do the job just as good as 37 or 67 layers. One core VG-10 layer provides edge hardness and sharpness, two outer layers provide corrosion protection. That’s it. One of my all around favorites is Tojiro DP Gyutou – 8.2″ (21cm) , Tojiro DP Cobalt Alloy Steel Series by 3-Layers. Fantastic value at very reasonable price of about $65. The harder the better. HRC range 60-62 is better than HRC 55-58. Wrong again. The HRC range 55-58 of top European brands (Zwilling, Wusthof) corresponds to steel grades providing the perfect balance of sharpness, hardness, edge retention, easiness of maintenance and corrosion protection as well as price. Three layer knife with VG10 core buys all sharpness and edge retention (HRC 60) you may need without sacrificing significantly easiness of maintenance. The HRC range 61-63 is a domain of micropowder SG-2 core knives at the price level of about $300, nightmare to sharpen and easily chipping. Knife sharpening is a mystic art practiced by Hattori Hanzō-like wizards. Believe me, it’s all about right angles, right tools and a bit of patience. Going asymmetrical and using old ceramic mug make razor-sharp wonders on a shoestring budget. The dimples (semi-circular scallops, so-called granton edge) reduce sticking/sucking effect. Well, they don’t, at least in practical terms. Eventually as the knife edge wears out from regular grinding the dimples may end too close to the edge to interfere with sharpening. Aesthetics aside the dimples are worthless.